New range of Hero scooters — Maestro Edge and Pleasure — has been unveiled in Nepal. Hero MotoCorp Ltd launched the new scooters at the ongoing NADA Auto Show 2017. Issuing a statement, the company said that the Maestro Edge demonstrates the passion for technology and innovation of a Hero. “Similarly, with the tagline ‘Why should boys have all the fun”, the Pleasure scooter has been introduced in the market with new style, celebrating the 10th Anniversary of the scooter,” the company added in the statement. 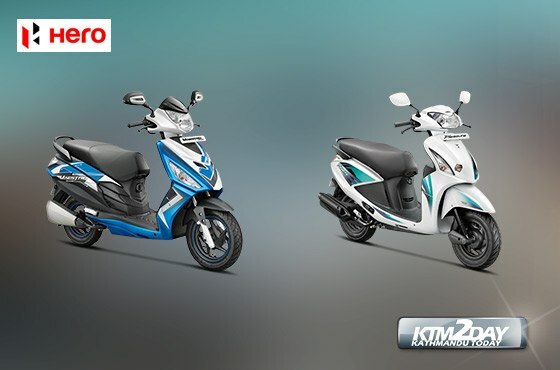 The company further said that Hero Maestro Edge offers optimum performance with a BS IV compliant 110.9 cc air-cooled, 4-stroke single cylinder OHC engine, producing a maximum power output of 8 BHP @7500 RPM and maximum torque of 8.7 Nm @ 5500 RPM. It is available for Rs 181,000. Similarly, new Pleasure offers an optimum performance with a powerful BS-IV compliant 102cc engine, the company said in the statement. “The Air-cooled, 4-stroke Single Cylinder OHC engine produces a maximum power output of 6.9 BHP (5.15 kW) @ 7000 rpm and maximum torque of 8.1 Nm @5000 rpm. The New Pleasure will be available across Hero dealerships with a starting price of Rs 165,500,” the company added.